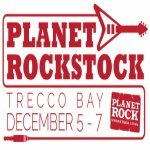 Def Leppard singer Joe Elliott was interviewed earlier today by Wyatt Wendels and said the band may play the Planet Rockstock event in December. Joe talked about opening for Mott The Hoople, the second Down 'N' Outz album 'The Further Adventures Of', its cover art, the success of the first album 'My ReGeneration', the third album of original material, his reasons for recording old Mott/Ian Hunter material, possibly playing at Planet Rockstock 2014, the Emm Gryner collaboration album, Vivian's health/back surgery, the next Def Leppard studio album/February session and UK live shows in 2015. Joe was asked about the possibility of playing the Planet Rockstock event in Wales and said he hoped the band could do it. NOTE - This may be in reference to the Down 'N' Outz as Joe had just recorded a Q&A session mentioned on 9th April and they seem more likely to play this event than Lep. The event takes place at Park Dean Holiday Park in Trecco Bay, Porthcawl, Wales, from 5th-7th December. More info via the link below. The line up has yet to be announced. Wyatt - Speaking of getting it heard we've got that little festival coming up in December Planet Rock Stock. I think you've had your ear bent. "I have just had my ear bent about it and I will say live right now. That having not even spoken to the rest of the guys. I don't know what they're doing. If we can do it we are gonna do it. Yeah." Wyatt - That would be fantastic.